Jack Nicklaus, joined by USGA representatives, discusses the upcoming documentary, Nicklaus: The Making of a Champion, with members of the media. Watch the #riseofjack Sunday on Fox Sports at noon EST. MODERATOR: Good morning, and a warm welcome from North Palm Beach, Florida. My name is Janeen Driscoll, the director of public relations at the USGA. I’m joined today by a team of individuals who have supported the development and broadcast of a one‑hour feature film entitled Nicklaus: The Making of a Champion. The film will air on the Fox Broadcast Network at noon EST, this Sunday, January 18. It is the eighth film released by the USGA, the third produced in collaboration with the Emmy award‑winning team of Ross Greenburg Productions and supported by our friends at Rolex. To that end, on the call with us today are the following participants: Mike Trostel, curator and historian of the USGA; Ross Greenburg of Ross Greenburg Productions; Bill Wanger, executive vice president of programming, research and content strategy for FOX Sports; Mark Loomis, coordinating producer for golf event production and studio programming for FOX Sports; and a distinguished gentleman who obviously needs no introduction, golf’s greatest major champion with eight USGA titles, an acclaimed golf course designer, successful businessman, tireless philanthropist and the 2015 recipient of the Congressional Gold Medal, Mr. Jack Nicklaus. We’d like to take a short opportunity to congratulate you on the Ohio State win and also wish you a very happy birthday on the advent of your 75th next week. All those mentioned on the call will be available for your questions later on in. Before we turn the floor over to Mr. Nicklaus, I’d like to introduce Mike Trostel, the USGA’s curator and historian, to briefly discuss the USGA’s purpose and role in the film’s development. Mike? MIKE TROSTEL: Nicklaus: The Making of a Champion is a USGA film, produced by Ross Greenburg and his team in partnership with Rolex, and it celebrates the life and career of Jack Nicklaus. As Janeen just mentioned, it’s the eighth feature film created by the USGA since 2012, and the reason we’ve created these films has been to promote the game’s history and tell the inspiring stories of our champions and championships. This documentary is the first of several events the USGA has planned to celebrate the Nicklaus family in 2015. In May, we’ll open the Jack Nicklaus Room at the USGA Museum, and the following month in June during U.S. Open week, we will recognize Barbara Nicklaus as our 2015 Bob Jones Award recipient. The film looks at Jack’s numerous accomplishments that are well written about: 18 major championship victories, eight USGA championship titles, more than 390 golf courses designed by the Nicklaus Companies, and tens of millions of dollars raised for charities, all while he and his wife, Barbara, have raised five children. We also explore the values that set Jack apart, his competitive spirit, self‑belief, commitment, integrity, perseverance and vision that were the foundation for his career and his life. The film features interviews with Jack and Barbara Nicklaus, their son Jackie, daughter Nan, and several players, including Arnold Palmer, Gary Player, Lee Trevino, Johnny Miller, Tom Watson, and Tiger Woods. I had the honor of interviewing Mr. Nicklaus a few times for the film in the new Nicklaus Room, and every time I asked about one of the championships he played in, he’d always start off by saying, oh, that was 50 years ago, I don’t remember anything, and then would proceed to recall every detail perfectly, down to the exact yardage he had, the club he hit and the thoughts he had in his head. It really was amazing. Janeen, I’ll turn it back to you for questions. MODERATOR: Thank you very much. We’d certainly like to start off with Mr. Greenburg. Mr. Greenburg, can you just tell us a little bit about your inspiration for the film itself? ROSS GREENBURG: Well, Jack is always the inspiration. Our relationship began when we produced a film on his 1962 U.S. Open in which he went into Arnold Palmer’s backyard and won at Oakmont. But then when the time came for the wing to be built and for a documentary to be made, Jack turned to us and said, you know, and gave us the principles by which he lives his life and the principles he took to the golf course over those many decades when he accumulated the 18 major championships. And so when you start to dissect why Jack was so successful in the majors, it becomes a beautiful storyline, and we were able to put together this 42 minutes of special television. It’s really all a tribute to Jack and his ability on and off the golf course. MODERATOR: Mr. Wanger, tell us a little bit about the fact that this is a very visible reminder of the USGA on FOX and the commitment on behalf of FOX Sports. BILL WANGER: Yeah, this film, once Henry and his team at the USGA told us about it and told us that they wanted to try to air it around the 75th birthday of Jack, we jumped at the chance, and we felt that this was a great way to kick off the USGA programming on FOX Sports, and what better way to start our coverage than with a film about the greatest USGA champion in history. MODERATOR: Obviously, a great moment we are leading into. Can you tell us a little bit about the timing of the airing of this particular film? BILL WANGER: Yeah, so it’s airing on January 18, three days before Jack’s 75th birthday at noon eastern, and it’s a special day for FOX. It’s the day of our NFC Championship with Green Bay and Seattle. We’re going to have a lot of people cycling through the network, and it’s a very marquee time period for the film. And then obviously we’ll rerun that film quite often on FOX Sports 1, and it’s just a great way to kick off our coverage. MODERATOR: Mike Trostel, can you talk a little bit about how this film is different from the film that we aired earlier in November, of course, that first aired in 2012? MIKE TROSTEL: Yeah, sure. I think with this one, we really wanted to focus on what the foundation was of Jack’s career, and he talked a lot about the USGA Amateur Championships being that. Also, I think that people know so much about what Jack’s records are—the 18 major championships, all the PGA Tour victories, the runner‑up finishes—but we wanted to understand why was he so successful and what really guided him, in not just life but in his career, as well. That’s why we tried to explore those values that set Jack apart: the competitive spirit, the self‑belief, commitment, integrity, perseverance and vision. 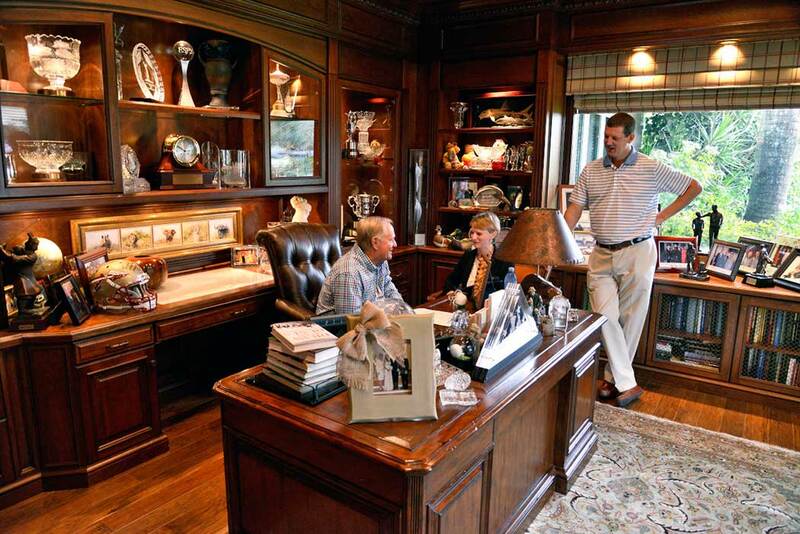 So it’s not just focusing on one championship or just his career, but we’re also looking at a broader vision of what made Jack such a great person with his dedication to family life, and now as he continues with his golf course design business. Q. Can you provide everybody on the call with an update of where we are on the Jack Nicklaus Room at the USGA Museum? MIKE TROSTEL: Right now we’re still on schedule to open the room on May 27, so we’re excited about that. We’re just finishing up, looking outside my window right here in my office, to the final building, so the artifacts will be arriving shortly, and we’ll be excited to open the building up in later May. We’ll have an on-site event here with Mr. Nicklaus and his family, as well, on May 27, so it’ll be a great addition to the USGA Museum, and our fifth room dedicated to one of our champions to join Arnold Palmer, Bob Jones, Ben Hogan and Mickey Wright. MODERATOR: Mike, just to lead back to the questions, I’d also like Ross to enter into this if you possibly can, tell us a little bit about the name of the film and the repetition of the word “champion” throughout the film and what it actually meant to you as you were making this film. ROSS GREENBURG: Well, I mean, I think as we dissected most of the championships that Jack won along the way during the 18 in total, we saw some common themes, and really the word champion is probably used in the context of trying to figure out how this happened and why this happened. You know, Jack’s obvious gift of being able to hit the ball farther and with that great putting stroke and short game, the word champion starts to pop up as those jackets would start to get put over his shoulders and the trophies start to get hoisted. But I think when all is said and done, it all started in ’59 with the Amateur Championship, about an 8‑footer to went in to beat Charlie Coe. Jack says once he made that putt, he realized that many would follow, and he would have the self‑belief to take it on for many years. I don’t know if he knew that he would be the first to win U.S. Opens in three decades or to win a Masters at age 46, but clearly he and his peers, as we went into the interviews with Palmer and Trevino and Player and Watson and Woods and Miller, it was clear that they understood what a true champion was and that Jack epitomized the word. MODERATOR: Mike, I’m going to turn it over to you to start the question‑and‑answer portion rolling. Q. Bob Jones was your father’s hero and someone who you certainly looked up to in your career. Can you talk a little bit about the significance of both you and your wife, Barbara, now winning the Bob Jones Award, the USGA’s highest honor in recognition of distinguished sportsmanship in golf? JACK NICKLAUS: It’s a very special award. I won it, I think, what, 1975, and Barbara 40 years later, and should have been the other way around, actually. She should have been a long time ago. But the Bob Jones Award was an award about a man who I thought as I grew up is what the game was all about and how it should be played, how you should handle your life, how you should lead your life, how you should beat others, be part of what is good about the game of golf, and to be given that award was a very humbling experience when I got it, and now I am so unbelievably tickled pink you might say that Barbara is being given that award. I think it’s really neat and something that she’ll enjoy going through the process this year and being part of that. Q. One more question before we open it up to the media. Just want to say congratulations again on the big win by Ohio State University earlier in the week. You won your first USGA championship when you were still attending Ohio State. That was the 1959 U.S. Amateur, as Ross Greenburg said earlier. You beat Charlie Coe 1‑up in the 36‑hole final. You talked when we interviewed you for the film about the putt you hit on the final hole as being one of the most important putts you hit in your life. Can you talk a little bit about the significance of that moment and how those USGA Amateur Championships really served as a foundation of your competitive career? JACK NICKLAUS: Well, I wouldn’t have thought about it at the time. It was an 8‑foot putt that I needed to make to win a match and win the championship, and I just went ahead and made it. But I look back on it, and the significance of it was that here I was in that position, in a position to make a putt, in a position to finalize a tournament, win that tournament, and I went ahead and did it. That putt I believe gave me the confidence and the belief that I could do it when I had to do it in the future. And so I think that was probably the most important putt that I probably ever made. Actually I won both of my Amateur Championships I was still a student at Ohio State, but it was— that was a big putt. Q. A couple years ago when you were asked if you ever had a sports psychologist, you said, yeah, my wife. I’m wondering if you could expound on that and tell how she did that role. JACK NICKLAUS: Well, yeah. Barbara was not only my wife, but she was the person that I bounced everything off of. My father passed away at a relatively early age. I used to bounce a lot of things off of my dad and get his advice, and when my dad passed, Barbara became sort of my confidant and someone I’d say, this happened, what do you think. I didn’t always take her advice, as she will say, but I certainly listened to her because she’s a devil of a lot smarter than I am. She always had good judgment and good solid values about what to do and what not to do, what’s right and what’s wrong, and that’s been a big thing for me. Even as it relates to playing the game of golf, I would sit there and think about something, and we’d talk. I can’t think of anything specific, but you know, by the time I’d bounce it off of her, not even knowing what the game—she’d go on the practice tee and I’d walk off the practice tee one day, and she said, well, I see you fixed your crooked backswing. I said, what are you talking about. She said, I don’t know, but it looks different, and now it looks normal. Little things like that were—I figured out what she was talking about, even though she didn’t really know anything about the game of golf at that point in time. Q. Is it possible for you to pick out a favorite major championship you won, or is that like asking you to pick your favorite kid? JACK NICKLAUS: A little bit. I think that—obviously you can’t pick your favorite child or the favorite golf course you did. I can’t really pick a favorite major. I think they were all significant and all my favorites. Every time I won one, it was certainly my favorite at the time. Obviously, I think the ’86 Masters was one that sort of stands out only because of the significance in my life. I mean, I was basically done playing. Everybody thought I was done, and to come back and one more time get myself in contention and do it was pretty special. Q. Ross and Mike, what did you learn about Jack that surprised you the most? JACK NICKLAUS: This ought to be good. ROSS GREENBURG: Surprised me the most? Well, I mean, in spending time with Jack, certainly how gracious and really how humble and disarming he is. Without embarrassing you, Jack, but when you’re dealing with icons, you tend to kind of put them up on that mantle and leave them there and just kind of gape at them, and I think Jack is just so comfortable with people and comfortable in his own skin, and I think the attributes that come across in the film speak to that. You know, the most amazing thing is to see Tom Watson in the film discussing how gracious Jack was in defeat, and the little words of wisdom he would give the players that had just beaten him on the 18th hole. That was really a nice quality of Jack’s that you don’t often see. And that speaks to his love of Bobby Jones and an understanding of what it is to not only win but how to lose. So that actually was probably the most interesting storyline. MIKE TROSTEL: I think for me it was just Mr. Nicklaus’s amazing recall for every detail. I mentioned it a little bit earlier, but down to the exact yard, down to the situation that he was in, talking about whether it was a championship he won or one that he came close in, just having that unbelievable memory, talking about things that are 30, 40, 50 years ago was really impressive, and the vivid memories that he had of growing up in upper Arlington, hopping a fence to go to Scioto Country Club where he grew up playing, and the vivid memories he had of his family and especially of his dad, something that really stuck out to me. Q. Ross, there’s a lot of archival footage in the documentary. Was that readily available for the USGA or was there a lot of effort needed to track down that material? ROSS GREENBURG: Oh, it’s always a lot of effort, and Jack and the family helped us quite a bit, as well. They had a lot of home movies. But the USGA did have a healthy amount of footage of Jack, which they’ve accumulated over the years, but we have some very special photos in the film, and there’s a constant search for the next great piece of video or film or photo out there that we’re trying to uncover and help us tell the story. It’s a never‑ending process, and we have a great team of research hounds here to try to get to all that material. Q. I was wondering if you could elaborate a little bit more on Barbara receiving the Bob Jones Award, specifically what was your reaction and even more so, what was her reaction when she first heard that she would receive the award? JACK NICKLAUS: I knew that four or five years ago when Annika Sörenstam won it, Barbara was in a run‑off with Annika for it, and I knew that Barbara didn’t know that. I never told her. I remember going down for the Olympic thing trying to get to the golf course with Annika, and I congratulated Annika on the Bob Jones Award. I said, Annika, as much as I love you, I didn’t vote for you, I voted for my wife. She got a big kick out of that. She was great about it. When Tom O’Toole called me and told me that Barbara was up for it, he wanted to make sure I saw my ballot because he wanted to make sure if I had a chance to vote that I would. I said, oh, man, this is neat. Here four or five years later, Barbara is back up again for the Bob Jones Award, and wouldn’t that be neat if she won. She’s been so great to so many people in the game of golf, and she’s contributed so much to what’s gone on with the wives and Tour wives, and the advice she’s given to all the young girls coming out, and the kids she’s been involved with, the charities she’s been involved with. Barbara is one person that is never on her own mind. It’s always somebody else and what can I do for them. That’s the amazing part about her. I mean, even last night, I said, Barbara, for crying out loud, put that stuff down and come enjoy eating. We were watching the Ohio State-Michigan basketball game last night. I said, come watch the basketball game for a few minutes. She came and sat down for about five minutes, she said, oh, I can’t do this, I’ve got to go write some more notes. That’s just constantly what she does. She’s always trying to do something for somebody else. Q. Barbara is going to receive her award at Chambers Bay, and I was curious what you thought of the Open coming to the Northwest for the first time and if you had any personal experience with Chambers Bay and what you saw of the course. JACK NICKLAUS: I don’t have a clue about Chambers Bay. I’ve never seen it. Is it in Seattle or is it out of Seattle? Where is it? It’s just outside of Tacoma, about 35 miles outside of Seattle. JACK NICKLAUS: Oh, okay. I didn’t know where it was. I can’t say anything because I don’t know anything about it. Q. What do you think about the Open coming to the Northwest for the first time? I know you’ve been out quite a bit working on that course outside of Lakewood. JACK NICKLAUS: Yeah, I think it’s great that it goes out there. It used to go around the United States. They found a location that would be suitable for it, and I think it’s great it’s a public facility. As I say, I don’t know anything about the golf course, so hopefully it’ll be a good course. Q. My question, you mentioned the ’86 Masters, Jack. I was wondering when you first remember hearing about holes 11, 12 and 13 being referred to as Amen Corner and what your impressions were of the man who coined that term, Herbert Warren Wind. JACK NICKLAUS: Well, I talked about Herb a little earlier—no, I didn’t talk about him. I talked about him in an interview I just did. Herb Wind, of course, did the book The Greatest Game of All, and I got to know Herb very well. I loved Herb. He was a wonderful guy, and he was probably America’s best golf writer up until you modern day guys, of course. But Herb was a great writer, very knowledgeable, and very insightful. Herb always had a way of looking at something differently than everybody else. That’s why he came up with Amen Corner. I think that’s why the phrase stuck. When he first named it, I don’t remember when he named it, but it was—obviously, when I go to play at Augusta, all of a sudden, you’re going to go play Amen Corner now. I never thought much more about it than that. Q. As your major record attests, you play difficult courses really well. You’ve spoken about how you really didn’t like to play courses where they were birdie‑fests and you had to go very low to win. Can you explain why that was, and then are you at all surprised that Tiger would make his first tournament of the calendar year one of those type courses? JACK NICKLAUS: I never had anything against those tournaments. It just seemed like when a golf course was relatively easy, it didn’t really separate you from the field with good golf. I remember—nothing against Wethersfield in Hartford, Connecticut—I went up and played that, finally got me to go up there and play one year, and—I’ll be a little off on this but pretty close—I shot 68 the first round, and I was like in 17th place, and I shot 67 the second round and I was like in 25th place, and then I shot 67 the third round and I was like in 32nd place, and I shot 67 the last round to finish about 35th in the tournament. And I said, you know, that’s just not my cup of tea. I played not as well as I could play, but I couldn’t separate myself. When I got a difficult golf course where it was not just all birdies, it was actually having to do other things, drive the ball, hit good iron shots, having to recover because you’re going to make some mistakes, I enjoyed the thinking part of it and having to really manage your game and manage that golf course, and I thought a more complete golf course was one of the more difficult ones. Obviously if the U.S. Open is played on a difficult golf course, they don’t go to the easy golf courses for the U.S. Open, because they want to test everybody and test every phase of your game. And unfortunately I think the easy courses, even though a lot of them are really nice courses, as was Wethersfield, it just didn’t test me enough to get what I wanted out of it. The last part of your question was? Q. Are you surprised Tiger seems to have a similar mindset and yet he’s playing the Phoenix Open or the Waste Management Open? JACK NICKLAUS: You know, I think that sometimes I would go play tournaments early in the year that actually you did shoot some low scores because I didn’t feel like I was quite ready to challenge a difficult golf course. So sometimes I would go where I could build confidence in my own game, so my guess is Tiger is going to Phoenix so he can build confidence in his own game and get some self‑confidence because he hasn’t played for a long time, to now build himself back up to the more difficult courses. Q. I was just curious if you could speak to golf’s attachment to its history? Obviously, this documentary in the room at the USGA Museum, but also there’s obviously nostalgic reflections of Arnie, and it seems like golf more than other sports, our game has this connection with its history. Why do you think that is, and what do you think it says about golf? JACK NICKLAUS: Well, I don’t really know how to answer that. I think other sports have that, too. Golf being an individual sport, you can pretty well tag the efforts of an individual and his own results on his record, whereas Michael Jordan was part of a team, Magic Johnson was part of a team, Brett Favre was part of a team. It wasn’t totally their effort. The effort had other people involved with it. And in golf, it is really your effort and your result and what you did. Sure, you’re in competition with the other guy, but you’re the only person you can control on the golf course is yourself. I have no control over what Arnold did or Gary did or Tom or anybody else. I only had control over what I did. And so I think it’s probably a little easier to document that, a little easier to really get a little bit more in depth on that than it is with some of the other sports where other people had an awful lot to do with it. Q. It seems like looking at your career and the arc of Tiger’s career maybe short of shows what remarkable success you had. It kind of seems like in some ways it reinforces how difficult it is to stay on top for a long time as you did and as he did to some extent. I’m curious if you think Tiger’s career in some ways kind of reminds people how great a career you had. JACK NICKLAUS: Well, that would be a difficult question for me to answer, but I think that Tiger has had a great career, and I don’t think his career is over. He’s had a little lull in his career, and we’ll see what happens from here. I had lulls in my career, too. I had several periods where I had three and four years that I didn’t win anything of a major championship, and I came back from that, and I think Tiger may do the same. But one of the things that I did most of my career was I paced myself. I didn’t play too many tournaments, and I tried to always be as fresh at the end of the year as I was at the beginning of the year. That was not easy to do. I received a lot of criticism for skipping a lot of events and so forth, but I had to do what was right for me and what I felt was best to be able to perform at a high level every time I played. So that’s what I did. Q. Can you talk a little bit about what you see as sort of the state of American golf? We have four players ranked in the top 10 right now, but there’s seven ranked in the top 14. That’s certainly very healthy for the sport, especially here in America, but what do you see when you look at that and what do you think about when you look to the future of American golf? JACK NICKLAUS: Well, I think American golf from a tournament standpoint is pretty healthy. I don’t think we’re as healthy from the juniors coming into the game, women staying in the game, as we could be, and I think we’re working on programs to try to help that. But as far as tournament golf, you know, we’re good. I mean, there’s a lot of criticism that came from the Ryder Cup and not winning that, but I think you’re going to go in cycles on that, and right now there’s a lot of really good players in Europe, and they just played better than the American players. That’s all there was to it. There’s nothing magic about it, it’s just that they played better. But that’ll turn around. The American players have their pride. They’ll play better as time goes on, and they’ll win their share of Ryder Cup matches. You say we’ve got seven of the top 14, that’s pretty good. The world is growing as it relates to the game of golf. We’re getting more and more players from everywhere. So to see that the United States still has seven of the top 14, that’s a pretty good record. Q. Jack, a couple decades ago, soon before he turned 80, Ben Hogan said he so dearly missed hitting golf balls, which was his lifelong passion. You’re on the cusp of your 75th birthday. I was wondering what you miss, whether it’s the competition, the camaraderie or whatever. JACK NICKLAUS: I miss my golf game. Golf was my vehicle to competition. I mean, I dearly love the game of golf and I love playing the game of golf, but when you lose your vehicle to competition and the competition is what really excited you more than anything else, then it’s really—you lose your enthusiasm. I mean, I go out and—I’m actually playing golf this afternoon with a couple friends of mine that I play tennis with a lot, and we’re all about the same. You know, we have a good competition, but that’s certainly not U.S. Open or Masters or PGA Championship. It’s going out and I give them eight shots, and we get down to the end of the day and one guy hands the other one 20 bucks, and that’s not exactly what is my idea of a U.S. Open. Q. I don’t mean to pummel you with Tiger questions but I do have one more. The last time we saw Tiger in action at Isleworth in December he was struggling mightily with his chipping. I’m curious, as someone who had his own chipping demons from time to time, what was your reaction to Tiger’s struggles, and do you have any advice for him? JACK NICKLAUS: I didn’t see any of them. I wouldn’t have any idea what he had. I don’t know what his struggles were. Tiger has always had an unbelievable short game, and I don’t think that’s going to leave him. His father was very good at teaching him at a young age, he not only taught him—got him to work and have a great short game, but he also taught him how to play with every club in the bag and how to hit a 150‑yard 5‑irons and 210‑yard 5‑irons. He taught him how to hook the ball, slice the ball, hit it up, hit it down, many things that he did, and short game was one of them. I don’t think Tiger’s short game will go anywhere. Maybe it was just rusty, but that will be the strong part of his game. What Tiger has got to get back is his long game and the game between his ears. Q. When you were struggling with your chipping, was there anything in particular that got you over the hump? JACK NICKLAUS: 1980, I started almost putting the ball around bunkers I was so bad, and I went to my old friend Phil Rodgers, who was a really good short-game player, and I asked Phil if he would help me. Phil got me in his figure‑8 swing, which is sort of take it outside, drop it inside, and hit it from there and then flip to an 8 coming back the other way, complete the 8. But my short game totally changed because I had something to work on positively, and I worked on it, and I mean, it could have been many different things I could have done, but that happened to be what I did. It worked very positively for me, and I remember getting to the U.S. Open, and the last round I was 66 yards from the hole, and I said, OK, Mr. Rodgers, here’s your figure 8. Let’s see how good it is. I hit it in about 4 feet, and I said, thank you, Phil. Q. Statistical analysis seems to be becoming a bigger part of the game each year. I was wondering if at the end of any season there were any particular stats that you would look at that would dictate what you worked on in the offseason? JACK NICKLAUS: Zero. Nobody ever kept stats. Greens in regulation was about the only thing we ever kept. I knew to win the Masters you had to be around—hit at least 75 percent of the greens, and most of the other golf tournaments I sort of looked at the same way. As it relates to putting, I never really paid any attention to that because that was really a product of how many greens you hit, and they didn’t keep all the other stats. I mean, I think one year after I was finished playing by 10 years, they finally kept driving statistics, and I think I was the long driver with 285, and DeWitt Weaver was second with 284. That’s all I remember. I don’t remember when that was. Probably about mid‑’80s. First time I ever had my swing speed checked was ’98. I was 58, and I was out at it was either Titleist or Callaway, I can’t remember which it was, out on the West Coast, and first time I ever had my swing speed tested, and I was 118 miles an hour, and I said, wow, that’s pretty good, I guess. They said, yeah, there’s only one other guy on the Senior Tour, Jim Dent, was 118. That’s the only comparison I ever had. We never had any of that stuff. Q. Do you think it would have helped, or would it have just been annoying to follow that stuff? JACK NICKLAUS: It would be annoying to have to answer your questions about it. I don’t think it makes a tinker’s ton. It depends what score you shoot at the end and whether you win or lose. Q. You’ve talked quite a bit about when you were winning majors, you were winning them against guys who knew how to win them, Palmer and Casper and Watson, etc. Now that the depth is so great out there and you get the best players from all over the world, are those days gone, and will it make it harder or easier for a guy to separate himself—like Tiger and to a lesser extent Phil has done—in winning majors? JACK NICKLAUS: Well, I think we went through a bit of a lull of guys that had experience in winning, but I think you have plenty of guys that have the experience of winning out there now and winning multiple tournaments. And so I think you’re back a little bit more into the era of when I was playing. You’ve got some really good players out there right now, and they’re winning on all continents. You probably have as great a depth as you have in the game today. I think it will become more difficult to win, yes, absolutely. Q. Did you ever have any security issues at a tournament? Threats or anything like that? JACK NICKLAUS: Yeah, we had them. Just never talked about them. Q. How did you feel about the film when you first saw it? JACK NICKLAUS: I think it’s kind of neat. I never really paid a whole lot of attention to what I did, but to have somebody sort of exaggerate, glorify it you might say, is very flattering. It’s been years since I’ve done any of that stuff. To go back and look at it, and see some of it and see some of the shots you played, it’s kind of fun. Q. How will you be celebrating your 75th birthday? JACK NICKLAUS: Quietly, I hope. I know that there’s—I’ve got a granddaughter that’s born on my birthday, and I’ve got a manager’s daughter at the Bear’s Club, Lori Wesselman, is the same day, and we’re all three having our birthday party together at the Bear’s Club. THE MODERATOR: Thank you so much for your time. We deeply appreciate it.